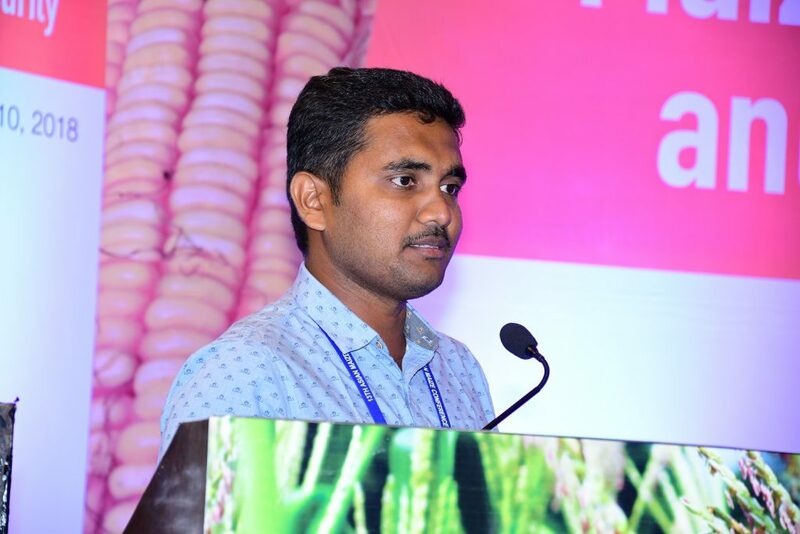 Vignesh Muthusamy was recently awarded the 2018 MAIZE-Asia Youth Innovators Award from the from the CGIARResearch Program on Maize (MAIZE) for his work on the development of biofortified provitamin A and quality protein maize (QPM) maize hybrids. A specialist in maize genetics and breeding, his research demonstrates the use of modern biotechnological tools in crop improvement. Vignesh is from a farming community in the Namakkal district in Tamil Nadu and isa scientist in the Division of Genetics, ICAR-Indian Agricultural Research Institute, New Delhi. In a recent interview, he discussed the challenges and opportunities facing maize in Asia, as well as the importance of nutrition and involving young people in maize-based systems. Vignesh Muthusamy, one of the winners of the 2018 MAIZE-Asia Youth Innovators Award, speaks at the 13th Asian Maize Conference in Ludhiana, India. Photo: Manjit Singh/Punjab Agricultural University. Q: What inspired you to pursue a career in maize-based systems? I hail from a farming family and due to India being an agrarian-based economy, most of the rural household is involved in agriculture. Lack of access of nutritious food is one of the primary challenges causing severe socio-economic loss in the country and maize,with such diverse end uses as food and feed can serve as an effective means of delivering a nutritious diet while bolstering the economy. Q: What do you see as the greatest challenges to increasing maize production? With population growth and changing climate, the challenges are multi-faceted. Changing climate variables pose novel challenges like water stress (both drought and excess moisture), disease epidemics and changing pest dynamics. We have to produce more maize to feed the ever-growing population under these conditions, using increasingly limited natural resources. While increased maize production is targeted, we must also consider the quality to ensure those dependent on a maize-based diet have a healthy life. Q: How can we address these challenges? Intensive research efforts and active collaboration are key to overcoming these challenges. Tapping the potential of untapped maize genetic resources and putting them into effective use in the maize improvement process is necessary. Active collaboration and partnership in research among maize researchers globally will help to understand and address these issues in a targeted way. Q: What projects are you currently working on? Why is this work important and how will it help maize-based systems? My research work focuses on the development of biofortified nutritious maize hybrids with quality protein and higher micronutrient content, like provitamin A, provitamin E, iron and zinc.The process of biofortification allows scientists to fortify staple crops like maize with micronutrients to address hidden hunger. I am also involved in a project developing specialty corn hybrids to meet the widening consumer preference. The development of biofortified maize hybrids with higher productivity offers tremendous scope to address widespread human malnutrition in a sustainable and cost-effective manner. This work also contributes to achieving key international development objectives such as the UN Sustainable Development Goals. 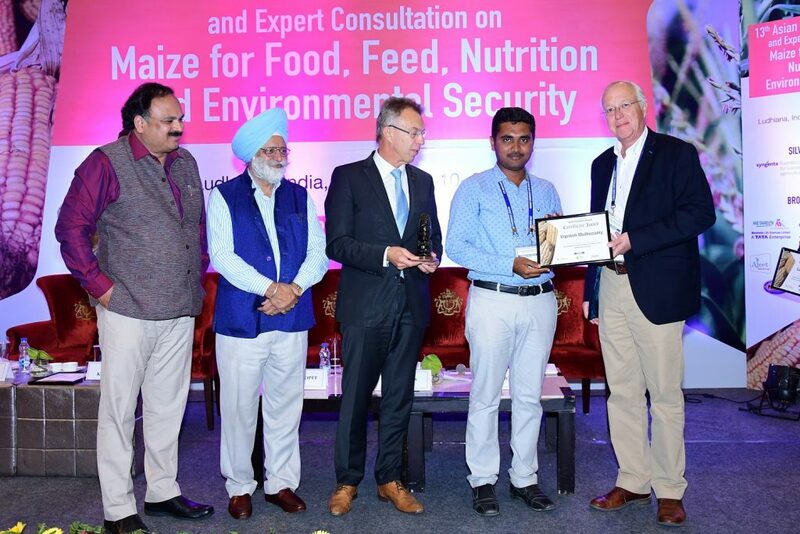 Vignesh Muthusamy receives the 2018 MAIZE Asia Youth Innovators Award at the 13th Asian maize Conference in Ludhiana, India. Photo: Manjit Singh/Punjab Agricultural University. Q: How can we better incorporate youth in maize Research for Development (R4D)? Involving youth actively in maize R4D is essential both at the product development and deployment phases. Involving young people in prioritizing research areas and equipping them with modern tools via training opportunities will help to achieve a long-term impact on maize-based research. Another key area is the involvement of rural youth in maize seed systems to produce and deploy the improved maize hybrids to the farmers. Q: What would you most like fellow young people around the world to know about you and/or your work? Our research efforts led to the development of India’s first provitamin-A enriched maize hybrid, ‘Pusa Vivek QPM9 Improved’. This is also the country’s first multi-nutrient rich hybrid with higher lysine and tryptophan. This provitamin-A enriched QPM hybrid is possibly the first example worldwide, and simultaneously addresses protein energy malnutrition and vitamin-A deficiency. Furthermore,work is now beginning to biofortify maize with additional micronutrients that would offer sustainable and cost-effective alternatives to food-fortification and medical supplements.